The verse Judges 14:5 tells us that “Samson went down to Timnah together with his father and mother” then Samson is suddenly attacked by a lion. They are not attacked, as after the attack “he told neither his father nor his mother what he had done” (Judges 14:6). So, in this picture I show Samson travelling with them but running off ahead. This also implies his eagerness to get to the Philistine girl he wishes to marry, as well as their reluctance. In the background we can see hills, I drew the shape of the hills based upon Google Earth images of the spot I chose, which was halfway between Zorah and Timnah. The darker ridges in the middle are the hills from Zorah to Eshtaol. 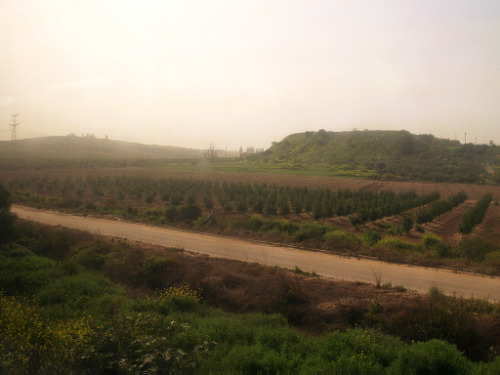 The three columns of smoke rising on the right signify the location of Beth Shemesh, which was a much larger settlement (city) that neighboured Zorah, but is hidden by the long green hill. On the path Samson is coming onto there are hoof prints and wheel tracks. This is to signify the common use of chariots and carts by Philistines in this area. In this picture the time of year is July/August. I decided on this because reading several commentaries and facts about petrification of flesh, I worked out that the body of the lion (which he is minutes away from killing) would have to dry out extremely quickly in order for any remains to be left for bees to create honey in, because bees won't make a hive in rotting flesh so it must have been completely dried out (basically mummified) in the baking summer sun. 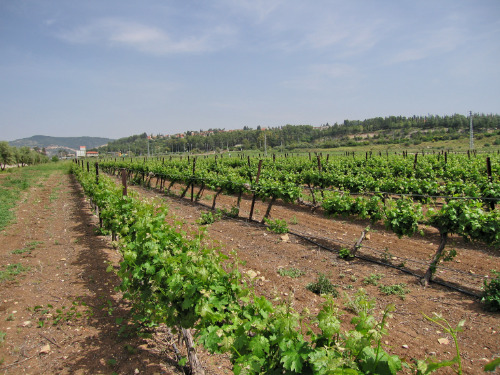 The choice of plants growing is informed by Judges 15:5 where we are told “He burned up the shocks and standing grain, together with the vineyards and olive groves.” So we know that growing around Timnah there was grain, olive trees and grape vines. Even today they cultivate grapes there. These images are from south west of Timnah and the Sorek Valley. I have drawn the three crops in the state they would be in in July/August, the grain field (wheat/oat/vetch/barley) is plowed and empty as it would have been harvested in April/May. The olive trees have tiny unripe olives on, as they would have been harvested in Sept/Oct/Nov, and the grape vines are lush and green because they are ready to harvest. In this particular picture you cannot see the grapes due to the shadows, but they are visible in subsequent panels. Due to Samson's Nazarite vow he should not have been at the vineyards of Timnah in any case, as many consider that even touching a grape would be enough to break his vow (Numbers 6:3a YLT). This compromised position could be the reason he was attacked by the lion. Stay tuned for my later blog on the lion and why it attacked Samson.